The Indonesian government plans to build a new airport outside Jakarta to accommodate a growing number of business travelers and tourists as the country’s economy expands. An earthquake measuring 5.3 on the Richter scale shook West Aceh district on Thursday, according to the Meteorology, Climatology and Geophysics Agency (BMKG). The entrepreneurship rate in Indonesia remains low, and the nation ranks 94th out of the 137 countries, Industry Minister Enggartiasto Lukita stated. JAKARTA: Indonesian authorities on Thursday (Oct 18) used helicopters to drop disinfectant on parts of the earthquake-and-tsunami-ravaged city of Palu, where thousands of decomposing bodies are still buried beneath once-thriving neighbourhoods. The paving of ground crack in Kampung Kadu Sirung, Pagedangan, Tangerang Regency, with asphalt or cement was considered not enough. The Governments of Indonesia and the Philippines have signed 10 agreements related to the border of the two neighboring countries. President Joko Widodo and First Lady Iriana paid another visit to West Nusa Tenggara Province on Thursday to monitor the handling of the impact of a powerful earthquake that struck the island of Lombok last August. Indonesia is considering cutting the tax on gains made from its sovereign bonds, as part of plans to attract more investors to the debt market of Southeast Asia’s biggest economy, the country’s director general of taxes said on Thursday. The seven-storey Roa Roa Hotel, with its clean lines and bright blue decor, was one of the few high-rises in the small Indonesian city of Palu, offering a dash of style to visitors on a budget. Berkarya Makmur Sejahtera president commissioner Hutomo Mandala Putra, commonly known as Tommy Suharto, opened Goro Cibubur – a large wholesale retail outlet – on the southeastern outskirts of Jakarta on Wednesday, marking his family’s return to the public stage after maintaining a low profile for years. Rainy season has begun in some parts of Indonesia, particularly on Sumatra Island, but the dry season has continued in other regions, such as on Java Island and East Nusa Tenggara. Following a spectacular fall from grace, beleaguered water treatment firm Hyflux got a S$530m lifeline on Thursday (Oct 18). PT Pegadaian (Persero) established Pegadaian Corporate University to create integrity and competent human resources (HR) and talent in the financial industry along with the transformation process in an effort to achieve short-term and long-term corporate goals. The Jakarta administration has opted to dredge rivers in Jakarta to prevent flooding as the rainy season is due to arrive in a few weeks. As host of the upcoming Our Ocean Conference, or OOC, Indonesia aims to strengthen international commitments in sustainable ocean conservation by proposing a review mechanism at the multistakeholder forum, ministers said on Wednesday (17/10). PT Japfa Comfeed Indonesia Tbk (JAPFA) through the Japfa Peduli program provides humanitarian assistance in the form of basic necessities, medicines, and emergency shelters. Indonesia’s state-owned Pertamina plans to import around 10 million-11 million barrels of gasoline in November, stable to slightly lower compared with estimated imports of 11 million barrels in October, market sources said Thursday. In order to help provide temporary shelter for evacuees affected by disaster in Central Sulawesi, State-Owned Enterprises (SOEs) began to work together to build Earthquake Friendly Houses (RRGs) in Central Sulawesi. JAKARTA (REUTERS) – Indonesia’s anti-graft agency said on Thursday (Oct 18) it had raided 10 locations, including the home of the deputy chairman of the Lippo Group, as part of a bribery investigation linked to the conglomerate’s US$21 billion (S$28.9 billion) Meikarta real estate project. Susi Pudjiastuti, Indonesia’s minister for fisheries and maritime affairs, has a strong message for China, owner of the world’s largest fishing fleet. Tech in Asia Jakarta 2018 happening next week on October 23 & 24 will play host to over 5,000 passionate entrepreneurs, keen investors, media, and the wider tech community. A number of fintech customers filed reports to the police, saying they were intimidated and defamed by debt collectors via social media. The debt collectors are said to be working for both local and foreign fintech companies offering lending services. Consumer goods manufacturer PT Unilever Indonesia has said that it will continue to manufacture Sariwangi teabags after the court declared the company’s manufacturers of the teabags bankrupt on Wednesday. Indonesia’s Ministry of Tourism has signed off on two tourism cooperation agreements with Brand Expedia, to drive bookings to 15 key destinations in Indonesia. The Foreign Affairs Ministry on Thursday said it cannot confirm the reported WhatsApp exchange between Indonesian and Australian foreign ministers, but reaffirmed that bilateral trade agreement remains scheduled for the end of this year. The Indonesian Film Agency (BPI) has highlighted the need for the Indonesian government to formulate a major strategy to maximize the promotion of Indonesian films abroad. Indonesia’s state-owned miner Inalum is looking to finalize a $3.85 billion deal for majority control of the local unit of global mining giant Freeport McMoRan Inc in December, a company official said on Wednesday. Bank Mandiri, one of the biggest financial institutions in Indonesia and the sixth-largest company that is listed on the Indonesia Stock Exchange (in terms of market capitalization), saw its net profit rise 20 percent year-on-year (y/y) to IDR 18.1 trillion (approx. USD $1.2 billion) up to and including the third quarter of 2018. This mid-October marks Anies Baswedan’s first anniversary as Jakarta governor. Despite the public’s running commentary and criticism of every single step he takes, Anies said he was doing a good job in office. An article entitled `Gempa 8,9 Skala Richter dan Tsunami Ancam Padang` or the 8.9-magnitude quake and tsunami threatens Padang City went viral on social media. The report, first released on October 12, 2010, had been shared for over 211,000 times through Facebook and other social media. The Presidential Special Staff for Economics Ahmad Erani Yustika said the premium increase was not a solution yet for the deficit issue at the Healthcare and Social Security Agency (BPJS Kesehatan). The government is still debating the right strategy to deal with the problem. Kebon Jeruk Police assured on Thursday that no act of revenge was carried out by a mass organization after one of their members was killed in a brawl during a party at Bandara discotheque on Jl. Daan Mogot, West Jakarta. The spread of false or hoax news is indeed common on social media. However, the public should keep up with ethics while using social media to avoid a legal problem. The acting director of informatics empowerment in the Communication and Informatics Ministry, Slamet Santoso, explained four ethics in using social media as follows. The Ubud Writers and Readers Festival which will be held on October 24-28, is set to be attended by Fisheries and Maritime Affairs Minister Susi Pudjiastuti. The catastrophic damage left behind by the 7.5-magnitude earthquake and subsequent tsunami in Palu, Indonesia still leaves people shaken to their very core. The managements of the Indonesia Stock Exchange (IDX) and Lippo Group are scheduled to meet on Thursday to discuss the fate of Meikarta, its flagship modern city in Cikarang, east of Jakarta, amid an ongoing bribery case. The Health Ministry has said that local pharmaceutical companies still relied heavily on imported chemical ingredients – active pharmaceutical ingredients (APIs) – because the industry was unable to carry out sufficient research on developing such materials. Vice President Jusuf Kalla is visiting Brussels, Belgium, to attend the 12th Asia-Europe Meeting (ASEM) and hold bilateral meetings with several state leaders. 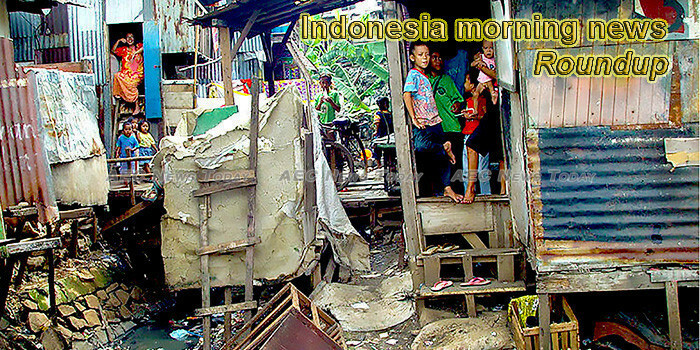 This week’s Indonesia morning news feature photo acknowledge International Day for the Eradication of Poverty, October 17.